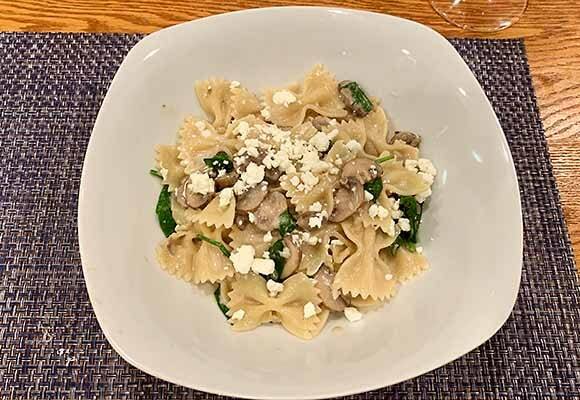 Date Night Pasta is a very delicious dish that is healthy and easy to make. We alter the original recipe found on Pinch of Yum. There are only two of us, so we half the ingredients as needed. The recipe calls for wheat pasta but we use the regular Farfalle. We also sub Half & Half for the heavy cream. Less fat, fewer calories, and still good flavors. You can buy all the Date Night Pasta fixings at Trader Joe’s for an inexpensive meal. We buy the Parmasan and the chicken broth when we stock up at Costco. The complete recipe is at the Pinch of Yum. What wine with Date Night Pasta? Has anyone tried Trader Joe’s new Unami spice? I think it might enhance this dish. I will give it go.